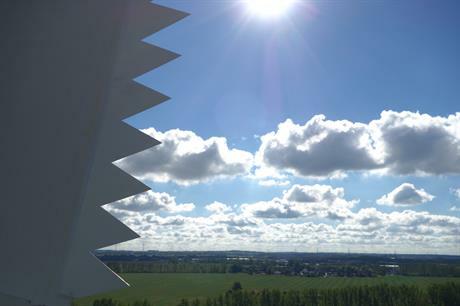 GERMANY: Nordex has unveiled two new products to reduce sound levels but increase yield. The manufacturer’s new package comprises two upgrades, a 'Sound Mode Optimisation' and 'Serrations'. Sound Mode Optimisation raises the torque of a turbine to improve the yield by up to 7%, while operating at the same revolutions per minute and maintaining the same power level, Nordex claimed. The Serrations upgrade, added to the trailing edges of the blades on-site, further increases yield by up to 6% and complements the increased output product by reducing the sound power level of the turbines by around 1.5dB, the manufacturer stated. Deployed together, the package is capable of achieving "significant reductions in sound power levels, while at the same time increasing turbine yield by up to 13%", the manufacturer claimed. The package is available for the N100/2500 and N117/2400 turbines in Nordex’s Generation Gamma platform as well as its Generation Delta machines.